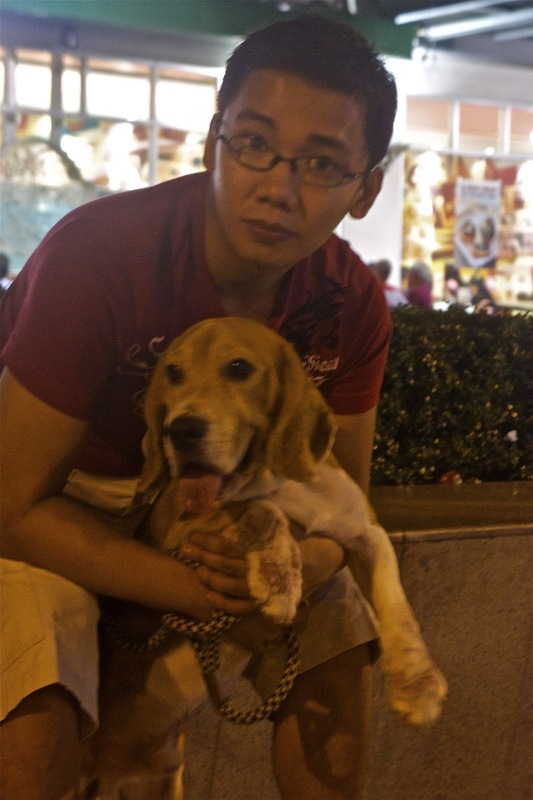 I have two Beagles: Midori and Macchiato. Both of them suffer from skin allergies. Macchiato's allergies are worse than Midori's - but I know that both of them find it uncomfortable. Midori's allergy manifests are red spots on her tummy. Macchiato on the other hand have too many skin disorders to mention. The latest one are spots on his left and hind leg - which apparently is allergy worsened by some fungal infection. Part of the problem for Macchiato is his hipothyroidism. For a while we got the allergies in check - but progressively - the symptoms came back. Our experience with these two dogs - definitely gave us an important life lesson. Never buy your dogs from pet-shops. Get them from reputable breeders - who tries hard to produce healthy puppies - not just cute ones. However - with all the allergy problems - we love them both dearly. I was actually thinking that if I actually had their allergy symptoms - I would probably be crabby all day. 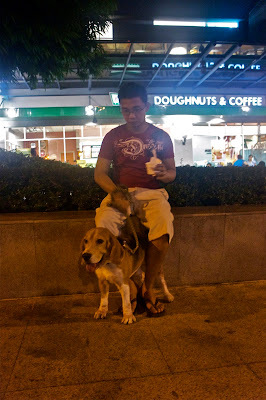 Midori and Macchiato are the exact opposite of Crabby - they are -- true to their nature - Merry Beagles. Here are some pictures of Macchiato and his Daddy Ryan. 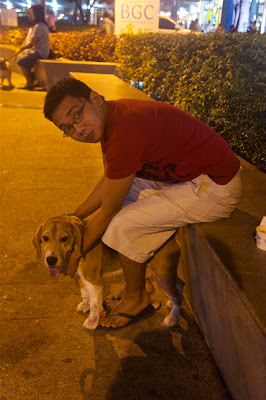 We gave him a break from the vet by visiting Bonifacio High St. Looking at this photos - I think you will agree - despite the skin problems --- he's one handsome beagle. That looks painful, poor pup! How ironic that Shar Pei's are the ones more known for having bad skin conditions. Hope your Pei's skin stays healthy. HI Laney. Thanks for dropping by. It must be painful - but we dont' know because he doesn't show any signs that he's in pain. He also doesn't scratch. On Char Siew the Shar Pei --- he's got healthy skin. Occasionally - he will itch - but those are during the times that he's molting. 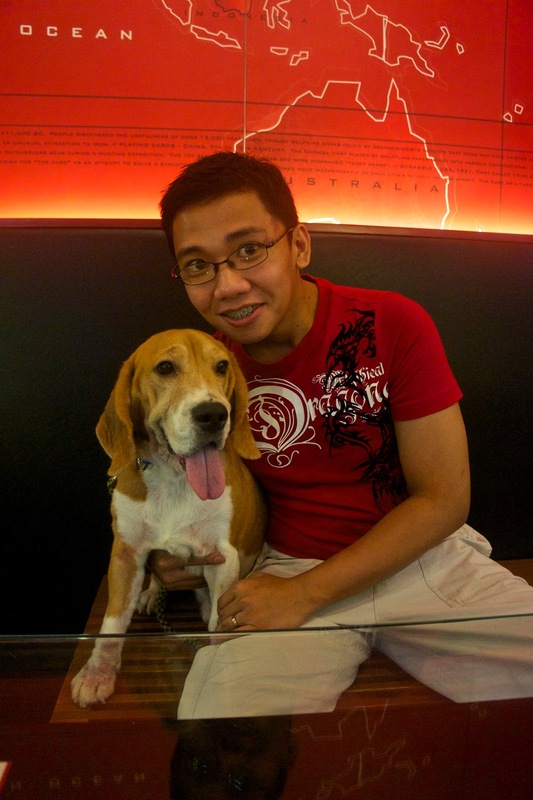 Which leads me to ask - do you shed like a Beagle or do you molt like a Shar Pei? I pretty much shed all the time! My skin is sensitive like a Shar Pei, but my fur is softer like a Beagle... except the black stripe down my back that are stiff like quills. I wish you lived close to us. I'd love to see you in person. I bet my two babies would love to meet you too. Beagle and Shar Pei mix is not common and judging from how you look and sound - it seems like a great idea. We wish we lived closer too! My mom would gush over your pups.